Generally speaking rabbits that have been clipped a number of times are not normally a problem. However like cats many rabbits may view being clipped with less than a degree of enthusiasm! Generally the way your rabbit behaves when being clipped will largely depend on how you will have “trained” it to being clipped as well as other husbandry tasks such as nail clipping. The more done at a very early age the better it will be both from the rabbit’s aspect as well as from yours! With any animal – large or small the first approach to being clipped is one that needs a degree of pre thought – one error in your judgement or approach can mean a long time before you again regain the animal’s confidence! (During which clipping will be a nightmare for both you and the rabbit!) Always reward with food after! The careful selection of both clipper and blade should be upper most in your mind. Both can make a big difference to the reaction of your rabbit! With either a new clipper or a rabbit being clipped for the first time, introduce the clipper in short and gentle stages. Long before you attempt to switch the motor on, allow the rabbit to sniff and explore the machine. Remember to your rabbit this is a strange if not fearful object! Take your time – Do not be in a hurry! Only when the rabbit appears to have accepted the clipper, make any attempt to run the motor. Do this from a distance first, then gradually in a place the rabbit associates with the security of its home. Run the motor for brief intervals. With acceptance, move closer to the rabbit each time. When the rabbit appears to have accepted the motor tone of the clipper, then and only then – bring the clipper to the animal’s body (Far away from the head or any known sensitive areas!) At this point do not switch on the motor – let the rabbit become comfortable with the feel of the machine against the body! Once you judge the rabbit has accepted the feel of the clipper then and only then, run the motor for a few seconds. Judge the reaction before proceeding further. Do this in short spells two or three times a day depending on reaction. Time consuming agreed, but worth it in the long run! 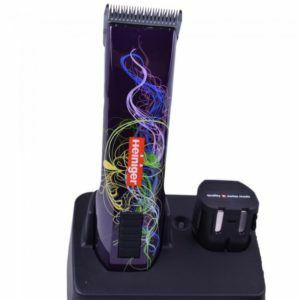 With any clipper, the two foremost requirements should be a machine with the lowest noise/motor tone level when running, and one that has no vibration. Noise and vibration are the two factors that scare an animal more than anything! This is something that affects all species of animals both large and small – not just rabbits! These comments apply to Angora rabbits as well as domestic breeds clipped for husbandry or sanitary purposes. With such a vast range of clippers and trimmers on the market regrettably a lot of rabbit owners get easily trapped into purchasing the wrong type of clipping machine for a variety of reasons. First – It clips in a manner that is as “pleasant” as you can possibly make it for the rabbit. Rabbits like cats in the main are nervous of the unknown and being clipped is not on their list of enjoyable pastimes as shown in the often violent reaction! Machine “noise or tone” and “blade vibration” are the two features likely to make the task of clipping difficult! Secondly – blade selection Selection of the right blade is important so that the fur is cut cleanly and not “pulled” especially if you are involved with matts” Understanding and selecting the most suitable blade will make not only your task easier to achieve, but easier on your rabbit. In any form of clipping it is the blade that plays the important role of “cutting.” The clipper is the instrument of power, tone and vibration! The selection of either corded (main powered with cable) or cordless (battery driven) is matter of personal choice! “Corded” machines are generally less expensive but have the disadvantage of both trailing and cable restriction. “Cordless” are more expensive! In recent years battery technology has made huge advancments. Batteries today are light, small, with good clip times and a fast re-charge times! Quality clippers are often supplied with two battery packs allowing continous clipping. Assessing the noise level and creating a “score” for any clipper or trimmer is intended for general guidance purposes only. A number of varying factors may exist – such as whether you are clipping inside a building, or outside in the open, can have a bearing on the noise level perceived by the animal. The introduction of any clipper should be done sympathetically and on a gradual basis if you have reason to believe your animal is either new to or nervous about being clipped. Noise Level Scores can be seen on each machine specification and are calculated as follows …. Clippers rated with this score are considered to be “almost silent” Currently only one has ever qualified – the Aesculap “Exacta” trimmer! Clippers rated with this score are considered to be of low sound or tone level. Those with a + added should be consider as marginally louder. Such machine would be considered suitable for all nervous temprements. 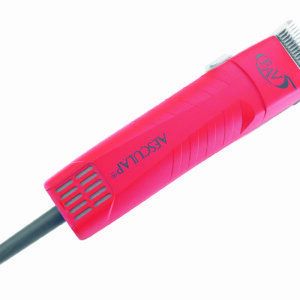 Aesculap clippers which have an exceptionally low tone are frequently listed in this category. Vibration factors tend to range from “minimal to eradicated” in this catagory. Clippers rated with this score are considered to be of a lower or average sound/ tone level. Those with a + added should be consider as marginally louder in tone. Clippers rated with this score are considered to be of a noisy sound or tone level. Those with a + added should be consider marginally louder in tone. Such machines are not considered suitable for any nervous temprements. Vibration levels may be high. Clippers rated with this score are considered to be noisy. Those with a + should be consider marginally louder. Such machines are not considered suitable for any nervous or new to clipping animal. Vibration levels may be high.